Render therefore unto Caesar the things that are Caesar’s. As Kenny Stabler used to say, “Easy to call, hard to run.” A thought prompted by the September 29 anniversary of the excommunication of the Holy Roman Emperor Frederick II in 1227. Well, one of four actually. Right away you see the problem. The Pope is meant to be holy. This other guy has “holy” in his title. And here they are hurling abuse at one another over political matters. Of course a lot of people don’t think the Catholic Church is all that holy. Indeed quite a few hate it bitterly. And no one has improved on Voltaire’s gibe that the Holy Roman Empire was in fact none of the above. But it’s noteworthy that while this particular excommunication was formally because of Frederick’s failure to take part in the Sixth Crusade it was really about political and military disagreements over European matters. Even a Crusade is sort of a mixed bag render-unto-Caesar-wise. It’s a war which is secular but with what were meant to be holy motives. And the Biblical injunction never meant kings should not try to defend churches, monasteries and schools against rampaging invaders; Alfred the Great certainly did exactly that and rightly so. But this whole episode was shabby and not least because the Crusades were used as a pretext. On both sides, it seems. Frederick actually had set out for the Holy Land before becoming too ill to continue, something his enemies downplayed or denied. But he only went on the crusade because he’d managed by proxy to marry Yolande of Jerusalem and promptly had his new father-in-law John of Brienne deposed as king of Jerusalem so he could bag it. Piety was not self-evidently his main motive. As for the Pope, his motives were essentially secular. The papacy was a major political player in those days and didn’t get along with the Holy Roman Emperors. 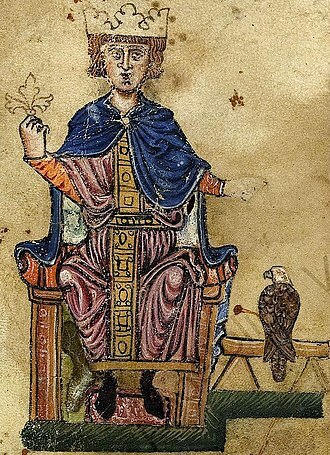 In fact Frederick’s predecessor Otto IV had been excommunicated by Gregory’s predecessor-but-one Innocent III, the same guy who backed Bad King John against Magna Carta and the Barons (which pace Dave Barry would be a good name for a rock band). Innocent had a bit of a case, in that Otto was trying to control the church in his territories and was leading an army toward Rome. But the deeper cause was quarrels over secular papal control of various Italian polities and alliances with various rulers. The same is true of Frederick’s issues with the Pope, who actually excommunicated him again when he did go on the Sixth Crusade in 1228, on the grounds that an excommunicated guy shouldn’t do so. There were legitimate grounds for dissatisfaction with some of his actions as a Crusader. But it is telling that by 1229 Frederick and Gregory were at war over various bits of Italy and when the excommunication was lifted in 1230 it was for political rather than moral or religious reasons. Interestingly enough Frederick does appear to have held views far outside the Catholic mainstream. Very possibly he wasn’t a Christian at all. Which I can see excommunicating him for if you are Pope. But when you only erupt into theological thunder when the guy is giving you political fits you wind up being just one more politician. In any case Frederick went on to demand the Church give up its wealth, fail to organize a European league against politically ambitious clerics, wage more wars, get excommunicated again in 1245 and die unexpectedly in 1250. His dynasty perished soon thereafter in conflict with a papacy whose political ambitions were dragging it down into the spiral of cynical worldly maneuvering that would see Borgia and Medici Popes and the Reformation. It would have been far better to leave politics to Caesar, surely, on practical and certainly on moral grounds.